Legacy: for the artisanal production of hams and charcuterie, the legacy from generation to generation is very important. The know-how, the raw material care and the dedication are essential to obtain quality products. Origin: All our products are cured in our facilities located in Santibáñez de Béjar, in the south of Salamanca, the cradle of the Iberian products. 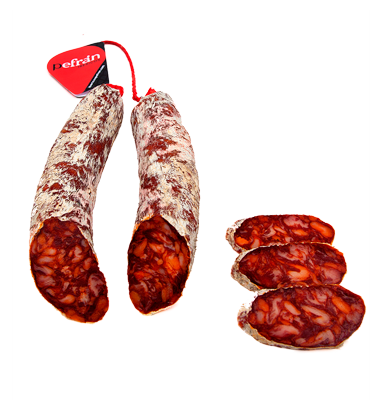 The air of the Béjar and Gredos mountains makes of this place a privileged zone for the fabrication of products derived of the Iberian pork. Time: The passage of time is a key factor of the process. At Pefrán, this factor has a vital importance, as our products pass through a long period for curing, without haste, manually controlled, step by step. The fresh pure air during the cold winter and the heat of the summer make the rest. It is a long wait of several years, assisted patiently by an experienced family, who every day cares for the optimal conditions of humidity, temperature and ventilation. Dedication: Working in which is your passion is a privilege. At Pefrán, we are proud of our profession and we work every day for reflecting this pride and this passion on our products, obtaining outstanding quality bites.